Island Roads staff have been helping volunteers put the final touches to the major project to restore and maintain Northwood Cemetery. Next month the Friends of Northwood Cemetery in Cowes will host a ceremony to mark the completion of their project that has included the complete refurbishment of two chapels one of which has been converted into a heritage resource centre. The Project has been funded by grants totalling £1.68m. from the Heritage Lottery Fund and the Big Lottery Fund. To help them get ready for grand opening, it has been a case of all hands to the pump with volunteers working hard on a number of tasks ahead of the big day. Island Roads have been among helpers with five staff members spending a day at the 17-acre cemetery. 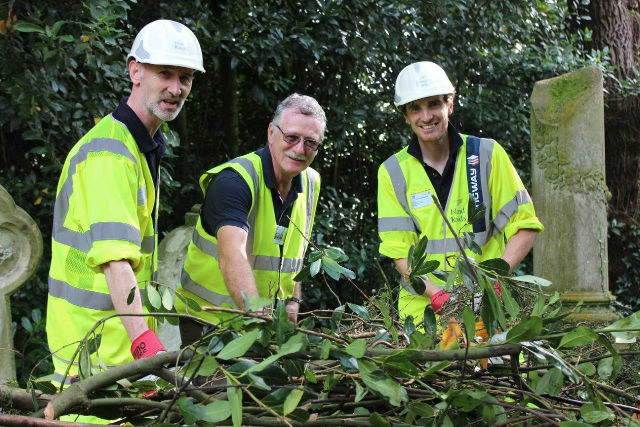 The Island Roads contribution has been under the company’s volunteering scheme that encourages all employees to take two days paid leave a year to support local good causes. The Island Roads contingent – Samantha O’Rourke (Communication Officer), Iain Thornton (Street Works Manager), Mark Dawson (Highway Design Engineer), Mandy Cooney and Ian Puzey (both operations and maintenance operatives) undertook a selection of tasks during the day including tree lopping, plot maintenance, general ground clearance and restoration of a plot. It is the second time an Island Roads team has spent time assisting the project having carried out similar work in 2014. “They have done a fantastic job. There has been so much to do ahead of the grand opening so we are thrilled that Island Roads have turned out in force to lend a hand.